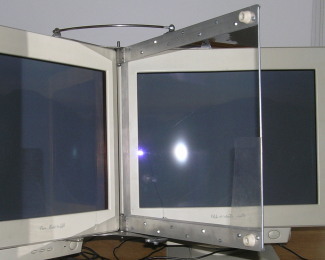 Two ordinary computer monitors arranged in a simple mirror stereoscope are still an excellent method of viewing stereoscopic content, in my opinion. Despite any development of dedicated 3D displays the advantages remain unchanged: Full resolution (no stripes), full colours, no ghosting, no flicker, comfortable viewing (no need to wear glasses) and unlimited selection of available monitors. Of course, only one person at a time can use the set-up - I use it primarily for adjusting and processing images, not for showing them to people. 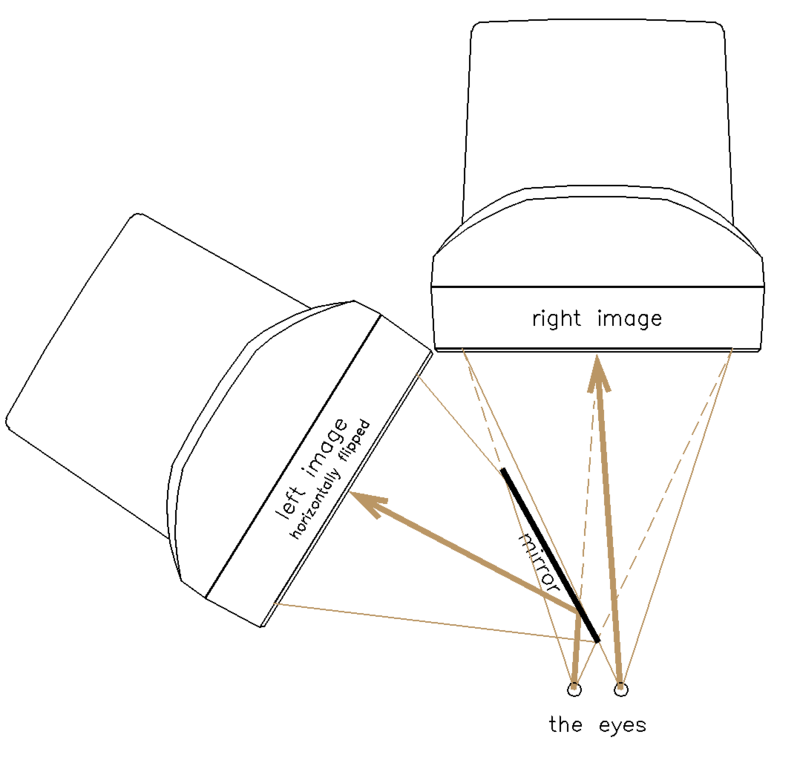 I use StereoPhoto Maker for image alignment and Geeqie (Linux) as a viewer. 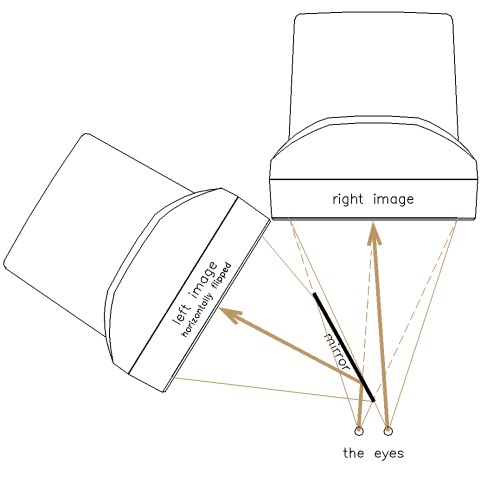 Both feature a specific viewing method for mirror stereoscopes - they are able to flip either of the images on the fly. The set-up is tilted upwards, resulting in a geometrically complicated shape of the stand. Alternatively, the whole thing could have been placed horizontally higher above the table, with the centreline at eye level, but I find this arrangement both more comfortable (ergonomic) and elegant. 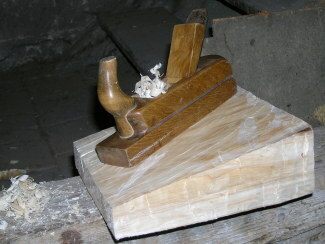 The base is a solid wooden board, supported by feet shaped to the desired angle. The vertical columns the monitors attach to are made of 15 mm plywood. To ensure precise and consistent alignment, the stand has to be very robust and geometrically correct. 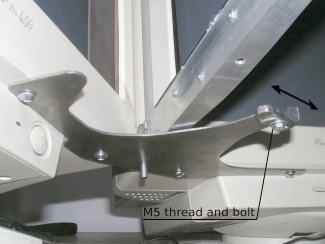 To simplify adjustments, the bottoms of the monitors are supported by M5 screws on each side (4 total). 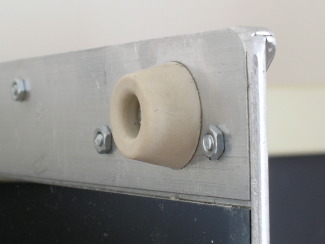 Screwing this screw out of the nut lifts the ajacent corner of the monitor. I left the screws of the VESA mount at the back of the monitors loose at first and tightened them after a precise alignment has been reached. For the time being (written in 2010) there is no consumer digital stereoscopic viewing technology that would at least approach the experience of viewing a stereo slide in a quality back-lit viewer (my preferred technology so far). To get seriously started in digital stereoscopic imaging I have decided to build a dual monitor - single mirror set-up (mirror stereoscope). This viewing method has been popularized by the stereoscopic guru, professor John Hart of Colorado. I would like to thank John for sharing his experiences and for supporting me with my own project. See also John's web-page describing the principle. The idea is simple - Both eyes seem to be looking straight at the front monitor where one image of the stereo pair is displayed, but the view of one eye (left in this case) is reflected by a mirror sideways, to the other monitor with the other half of the stereo pair - which is horizontally flipped. As long as the mirror is precisely on the centreline of the angle between the monitors, the geometry is correct and the image is undistorted. If properly adjusted, the image of the reflected screen exactly overlaps with the "front" screen from any point of view. 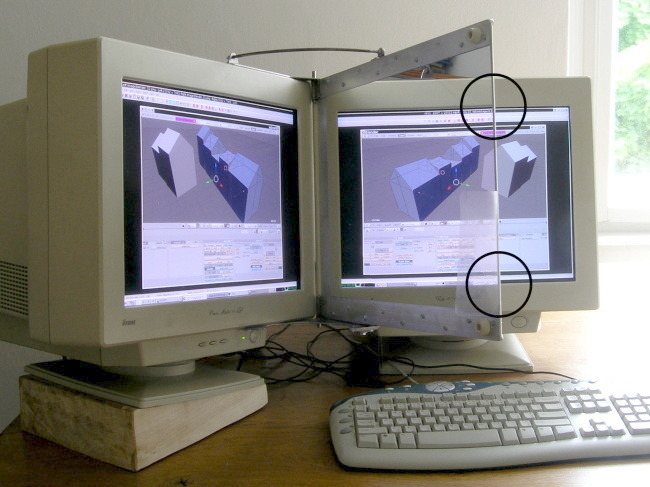 A dual head graphics card is used to connect both monitors to the same computer. 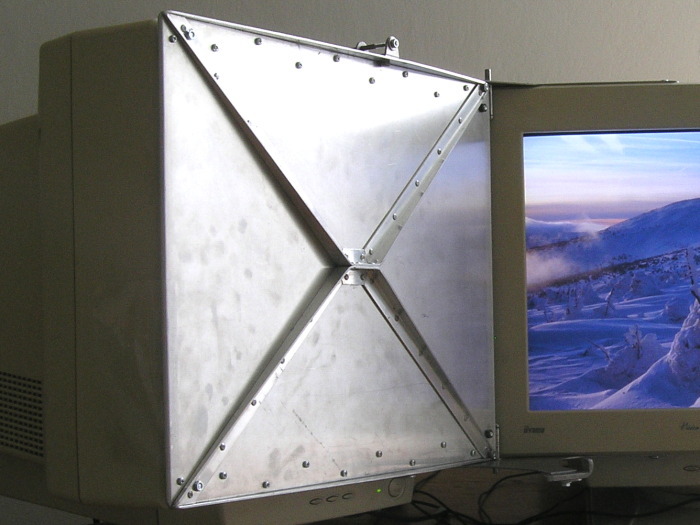 Two quality CRT monitors can be obtained quite easily nowadays as many offices are switching to LCDs. I got mine for free. The only remarkable investment is the required high quality front surface mirror (an ordinary mirror causes multiple reflections). The mirror I used (12" x 16") is larger than necessary, for my 18" (exactly 456mm diagonal) monitors, the minimal dimensions of the mirror would be about 260mm x 200mm (WxH). Otrhoscopic viewing - geometry providing a natural viewing angle, derived from the characteristics of 35mm slide viewers. Having this in mind, I have firmly fixed the monitors together. The mirror is on a hinged plate, which may be swung between the mono- and stereo- positions. The whole set-up is tilted, allowing for a natural and ergonomic use. All parts used are symmetrical, so the whole set-up can be easily changed to "mirror-right" arrangement. This may give you a basic idea how I constructed my set-up. I am sure that many things can be done more effectively with welding and other advanced techniques. 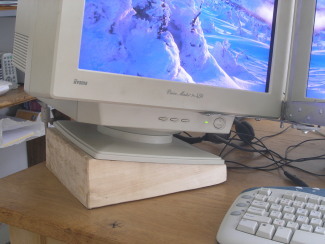 The first challenge was to find means of firmly but not permanently mounting the monitors together. 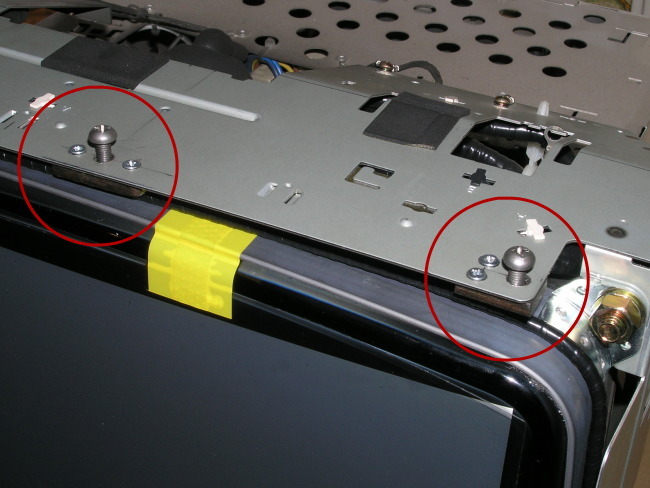 I have opened the monitor cases and used M3 screws to attach small steel plates with tapped M5 threads to the metal structure of the monitors (two at the top and two at the bottom of each monitor). 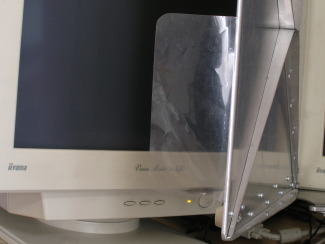 The screen has been wrapped in cardboard during the process to avoid damage. Once equipped with metric threads, the monitors can be attached together using metal plates (2mm steel sheet). The front surface mirror I used is less than 2mm thick. 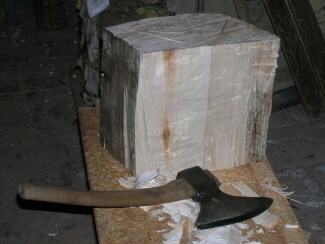 Therefore I needed a perfectly planar and rigid support, yet thin and not too heavy. I have used a sheet of 2mm duralumin, strengthened by aluminium L-bars. 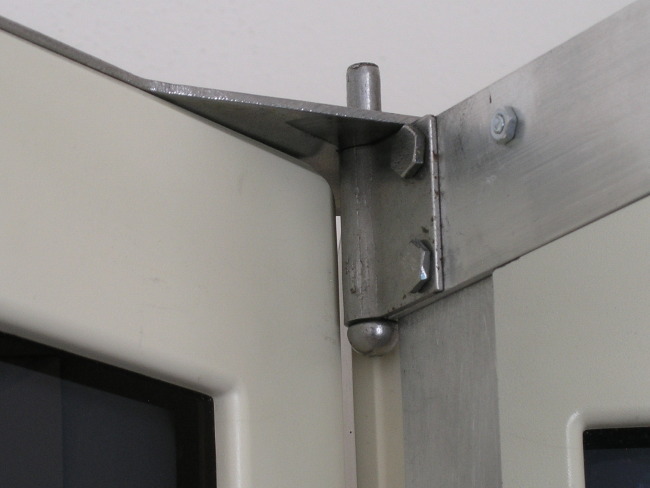 The purpose of the crossed bars is to avoid torsion. 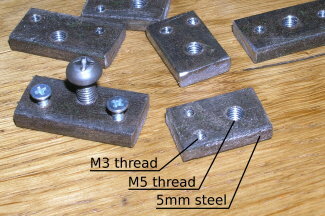 Attached using 3mm aluminium rivets. Top-front corner of the plate, showing the front vertical edge, formed by the duralumin sheet bent to 90 deg. 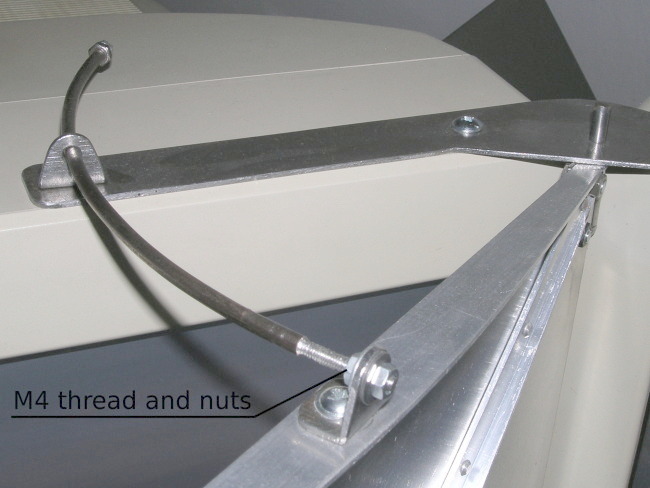 and rounded (hiding the sharp edge of the mirror), and the strengthening aluminium L bar attached at the top. A piece of clear plastic used to protect the mirror from breath.